Flat Top Travel Trunk from the late 19th Century. The oak slats compliment the wonderful solid pine wood, and really showcases the superb construction by the master craftsmen of the time. 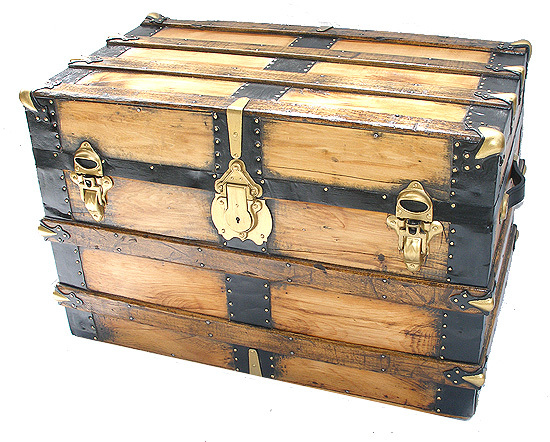 This trunk has been professionally restored trunk at LegacyTrunks, and is very strong and solid. The interior has been stripped to eliminate any musty odor, then cleaned inside and out, hand-sanded, and finished with multiple coats of tung oil. Black paint was used on the outside metal trim, and all latches, corner trim, and nails were hand-painted in gold. It comes with a solid lock that functions, and we do have the key! This trunk is in very good condition except for some normal wear and signs of age which were left unimproved. The top of the trunk also has some cracks in the wood but the wood slat staves are intact therefore not compromising any of the trunks structural integrity. The color is rich. The hardware is original. This chest is very solid and well built and should hold up for another 100 years to continue its Legacy. This would make a Great table, Coffee table or accent piece for the foot of a bed. The box measures 30 inches long , 18 inches wide, 20 and inches tall.